The Town of Shelburne’s Special Event’s Coordinator Shawnette Crouse says the theme for this year’s Heritage Day Street Festival will be “Back to the Old Jelly Days” with a western atmosphere. “We have so many new things this year – we are so excited,” she said. This includes a new date that pushes the big event to the third week of June. On Saturday, June 20th from 10am to 4pm the streets will come alive with sights and entertainment harkening back to days gone by. Old fashion games and contests, including marbles, a jack’s tournament, a pie eating contest, and the ever popular ice cream eating contest will help to create an old fashion atmosphere for the highly anticipated event. Live entertainment will include the welcomed return of the Lucas Ryan Band which entertained crowds at the 2014 festivities as well as the Oatman Band. New this year, the first annual Bed Races will take to the streets in a variety of shapes and themes created by participants. The Events Coordinator encourages everyone to, “Challenge a friend or business and come out for a lot of fun.” Look for details on the bed races in upcoming articles of the Free Press. JR Schooners minor fastball team is sponsoring a Soap Box Derby, and Tattoo Addiction will sponsor a Motorcycle Show and Shine. Always a colourful addition to the day’s events, Oatman’s Classic Car Show will once again line the streets with automobile history. There will be free Heritage Walking Tours throughout the day as well as an Open Air Market on William Street that includes booths from Epicure, Scenty, Me To We, Kinettes’ BBQ, food vendors, ice cream trucks, jewellery, wood working, leggings and more. The committee currently has 25 vendors with room for more. For the kids and families there will be pony rides, Farmapalooza petting barn from the Agricultural Society, and brand new for 2015, traditional Indian dancing. The Royal Canadian Legion will hold a family dance from 4–8 p.m., and also new to this year’s Heritage Day, Mad Dog Photography will be snapping FREE “time period” photos in the Family Zone. The Shelburne Free Press sends best wishes to the Street Festival Committee as they work towards this great community event. Committee Members include Special Events Coordinator Shawnette Crouse, Mayor Ken Bennington, Deputy Mayor Geoff Dunlop, Councillor Dan Sample, Josh and Jim Oatman of Oatman’s Classic Cars, Jodi Jones, Mel Acoust, Kevin Bowler, Lindsay Wegener, and Lesa Peat. More information on the 2015 Heritage Day events will be available at The Oatman’s classic car display which will be a part of the car show at the BIA Farmer’s Market on May 28th from 3–7 p.m. All Heritage Day events will be listed on the Town Hall website at www.townofshelburne.on.ca and Facebook page starting this week. 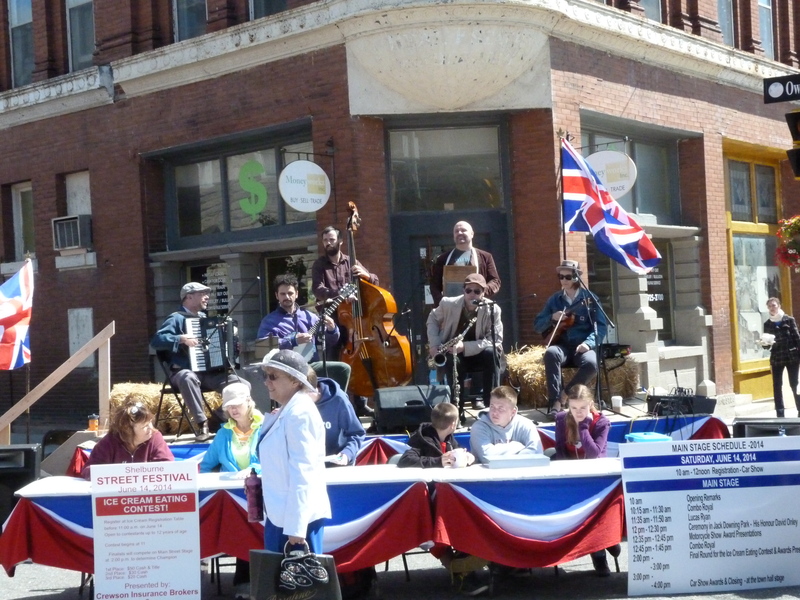 Live entertainment at the Heritage Day Street Festival will include the welcomed return of the Lucas Ryan Band which entertained crowds at the 2014 festivities as well as the Oatman Band.